But content always matters for readers. Everyday at least there will be a new reader for you and most of the time they will not tend to explore or go through your archives unless they landed to find older stories. So what would be your best solution to gain more exposure and increase engagement for your old content? Until now, we have had few solutions for this matter. Blogger let you show off your popular posts with Popular Posts Widget and you can make use of it to gain more exposure for you content. But it will work out only for your popular ones. In addition, you can display relevant content per post by using a Facebook Recommendations Box or Facebook Recommendation Bar. However each of these options has its own limitations. So here you will find another solution which you would really like to try out on your blog. The nRelate related content plugin is a solution with it's own unique features to prevent your articles from being lost in archives. The idea behind this widget and its features are much impressive as it offers more easy to use customization options. nRelate related content plugin will interconnect your posts with their relevancy and display them for your visitors with each of your posts. Further it will enable bloggers to show content from their partner sites, which are listed on their blogroll and help them to earn extra money by showing off sponsored posts on the widget. When it comes to customization, it allows wide range of options such as ability to change style, type of the widget and yet it is far more easy to implement too. Also it has the capability of controlling relevancy when you display related content and re-indexing feature will ensure up-to-date related content being displayed on post pages even you made changes to your existing content. You can count on nRelate for gaining more exposure and attention to your old content, and I hope you would love to experience its features at first place. Shall we implement it on yours? 1. Sign up for a new nRelate account and activate your account following the link in confirmation email. 2. Now log in to your account. 3. You will have to read and accept the Terms of Services to proceed. Click I Accept. 4. Go to Blogger Installation page and submit your blog URL. 5. Then you will be required to select the widget type. Read following descriptions and select the best widget type for you. 6. Click on the button representing your preferred widget type and you will redirect to another page. Make sure it has the correct blog selected and then click Add Widget. 7. 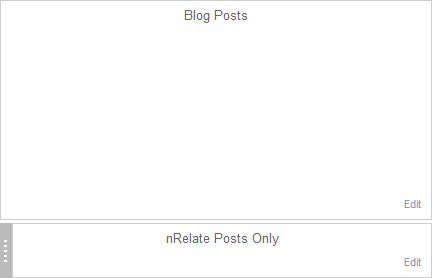 You will be redirected to Blogger Layout tab and will find nRelate widget has been added. Place it beneath the Blog Posts element and save arrangement. 8. Now, navigate to nRelate Settings page and click Settings link beneath your blog name. 9. All the preferences for your nRelate widget will be managed from here. As you change any setting on this page, the change will be reflected in your implemented related posts widget. Most settings are self-explanatory. But, let me take you through some of the settings available. You can select either to display your related posts with thumbnails or just only titles of posts. If you have selected related content to be displayed with thumbnails, you will be able to choose thumbnail size and default thumbnail image too. You can select the style of your nRelate widget here. You can review available widget styles from Blogger Style Gallery. Further, you can find default stylesheet for each widget style if you are interested in customizing your nRelate widget with CSS. You can define a custom title text to be displayed along with nRelate widget here. You can control the maximum number of related posts to be displayed on your widget, range from 0 to 10. How relevant do you want the results to be? Here you will be able to control relevancy of displayed related content in relevancy levels as Low, Medium or High. If your blog is about specific niche, then low setting will work for you. But if your blog covering a broad niche, or multiple subjects or topics, the high relevancy setting will help you to filter and show only relevant related posts for your visitors. How deep into your archive would you like to go for related posts? This setting will specify time constraint to consider when indexing your content to be delivered as related posts. Unless you have a specific reason to prevent older posts from showing up as related posts, make sure the time it denotes greater than your blogging time. For example, if you have been blogging for 6 years, specify it 10 years or a greater value. Maximum number of characters for title? This setting will determine how much characters to be allowed to display post titles. 10. Once you finish with settings, click Save to save changes. Your changes will be reflected on your nRelate widget. Note: You may find nRelate widget is not appearing on your blog as soon as you done with preferences. It may take some time as it is in the initial indexing phase. Once after it indexes your blog posts and pages, the widget will start to appear with related posts. * You can find statistics or engagement of your visitors with nRelate widget including clicks and impressions via Reporting page. * You can add up multiple blogs to your same nRelate account and each of widgets will be managed separately. If you wanna add nRelate widget for another blog, add it via Blogger Installation page. * In case if you you removed content from your blog or made major changes to your posts such as changing titles and changing post images, nRelate widget may not display those changes afterwards. If so, navigate to nRelate Settings and re-index your blog clicking Re-Index Website button. Note: The widget may not visible to visitors while it is in re-indexing phase and it may take up to 2 hours or more to complete re-indexing depending on number of content you have. Yet again, need some help. hehe..
Was trying to install this widget. I want it to be placed before my comment box on post-pages only. I tried using the placement only version. But when I paste the code from the widget below post-footer.. nothing happens. can you help me out. I can see related post widget on your posts. As I mentioned in the post above, it will take some time to appear until it indexes your content mate. Is there a private label version? I do not want branding on my pages. Also, I don't see it being used here on this blog but you say you like it? Did I miss it? Hi Rob :) The related posts displayed above comment form are rendered using nRelate widget mate. Branding? 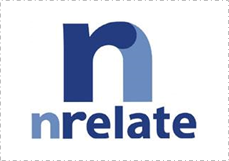 Oh I hope you mean nRelate logo. You can get rid of it at widget settings page. Oh wow I didn't even see that. The related posts look like part of your page, I thought they were a wordpress plugin/theme option because of no branding on there. So using the nrelate plugin you can save on server resources? I hear that wordpress related plugins use a like of resources and make lots of queries to the database. Have you noticed a difference in site speed and loading times? the nrelate in my blog show related item such as contactus & about us which i dont want.and theres no option in 'exclude category' to hide my pages. ? any advice please? thanks pal, i did select 'post only' from the beginning, everything fine now after reinstall for the 2nd time. cheers.. I use nrelate for some time now on my photography blog http://blog.burnedshoes.com - I have managed to re-install nrelate when moving my blog from the standard Tumblr adress to a custom URL. Today I have created a "test URL" to try out a few things, my question is: how can I remove such "test URLs" or test domains on the nRelate Account Website? I only have the possibility to enter more domains in the Tumblr settings of the nrelate website (I know this is not a Tumblr forum, but maybe it works the same way for all platforms), but no possibility to delete unnecessary domains. Thanks in advance! I've been trying it on few other blogs and couldn't find a way to remove 'em too. You gotta go with it and it's alright as it doesn't affect on your blogs. Also you can change domain specific settings by selecting the URL there. So, I guess mo problem instead of listing unnecessary domains.